Whether you’re looking for growth, value, or balance, you can find all three types of investments in this space. Kroger (NYSE:KR) is the largest conventional supermarket chain, but it's still not as big as Wal-Mart Stores' (NYSE:WMT)grocery store. 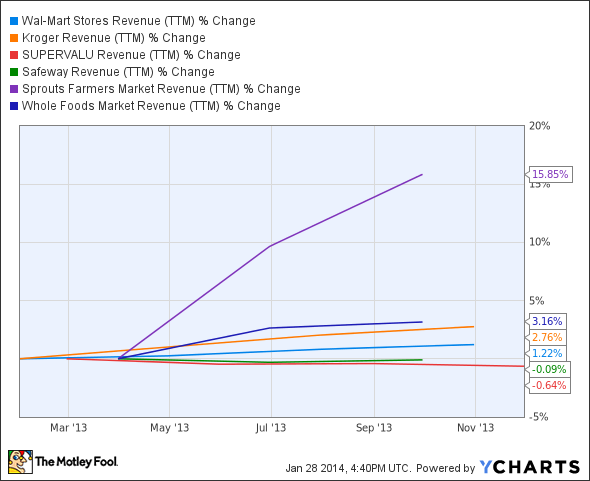 However, Kroger and Wal-Mart are now "the big two" in the grocery category. "The big three" no longer exists after Safeway sold its Canada division and shut down Dominick's in Chicago. Supermarket News recently reported several changes to its supermarket ranking list, with the rankings being based on volume. We'll take a look at these important changes, why they occurred, and which grocery stores should offer value, growth, and balanced investment opportunities. As you might have guessed, Wal-Mart is No. 1, and Kroger is No. 2. Wal-Mart sells quality food at discounted prices, and of the 4,807 Wal-Mart stores in the United States, 3,275 of them are Walmart Supercenters. Wal-Mart also generates approximately 55% of its revenue from its grocery stores. Despite that being the case, Kroger could see market share gains thanks to its recent acquisition of Harris Teeter. SUPERVALU (NYSE:SVU) has dropped to No. 16 on the list from No. 6 last year, primarily due to the sale of 877 retail stores to Albertsons. This sale has helped Albertsons (private company) move from No. 35 to No. 10, but the acquisition of 50 locations from United Supermarkets in Texas also played a role. Alberstons now has more than 1,100 stores. As far as SUPERVALU is concerned, it's now more focused on its legacy food distribution business and its Save-A-Lot brand. These stores don't offer as much variety as most supermarkets. Save-A-Lot stores are more focused on selling high-demand items. It's good that SUPERVALU is aiming to become leaner in order to strive for sustainable profitability, but investing in a company that consistently bleeds red isn't recommended. As far as Safeway is concerned, it has remained in the No. 5 position. However, after selling off its Canada division and shutting down Dominick's, volume has declined. Way down on the list, with a Supermarket News ranking of No. 50, is Sprouts Farmers Market (NASDAQ:SFM). Sprouts Farmers Market might not rank very high right now, but don't be shocked if it cracks the top 10 five years from now. Sprouts Farmers Market was ranked No. 57 last year. The reason for its growth: high demand for healthy food at affordable prices. That's exactly what Sprouts Farmers Market offers. Look for Sprouts Farmers Market to slowly but steadily grow geographically, moving east of the Mississippi River and into the Southeast. It will take a while, but Sprouts Farmers Market should eventually steal some market share from Whole Foods Market (NASDAQ:WFM) as well as other traditional supermarkets. This is due to the simple fact that much of Whole Foods Market's food is sold at a premium. Whole Foods Market is lowering some prices, but even if it goes that route, the public perception of Whole Foods Market selling natural and organic food at premium prices will be difficult to shed. On the other hand, expectations are very high for Sprouts Farmers Market. It's currently trading at 63 times forward earnings. This is much more expensive than peers, with Wal-Mart, Kroger, SUPERVALU, Safeway, and Whole Foods trading at 13, 12, 9, 19, and 26 times forward earnings, respectively. And if you're looking for dividend payments, you won't find them with Sprouts Farmers Market (or SUPERVALU). Wal-Mart, Kroger, Safeway, and Whole Foods offer dividend yields of 2.5%, 1.8%, 2.6%, and 0.9%, respectively. If you're looking for growth, then you won't find many better opportunities than Sprouts Farmers Market. However, this growth comes with risk considering the high multiple. If you would prefer to play it safe with larger companies that generate strong cash flow and offer somewhat generous yields, then you should consider Wal-Mart or Kroger. Whole Foods Market falls somewhere in the middle. It's still a growth story, but it doesn't present as much growth potential as Sprouts Farmers Market. And while it generates strong cash flow and pays dividends, it's doesn't do so at the same levels as Wal-Mart and Kroger. The correct decision here depends on your investing strategy: growth, value, or balance. Please do your own research prior to making any investment decisions.